We are experiencing something of a bubble in education…a bubble as pernicious as the bubbles we had in technology in the 1990s and in housing in the 2000s. In every study that’s been done, the data are black and white. College greatly enhances the earnings potential. There’s an entire middle ground. You want to provide the opportunity for people to make the choice that’s right for them. The value of a college education is under attack. While more U.S. students are enrolled than ever before, a perfect storm of soaring costs, rising student debt and shrinking job prospects have led critics to increasingly challenge whether college remains a worthwhile investment. Among those leading the attack is PayPal co-founder Peter Thiel, who charges that higher education has become a dangerous bubble. Thiel, whose own credentials include bachelor’s and law degrees from Stanford University, has put his money where his mouth is by awarding $100,000 two-year fellowships to 20 promising teenage entrepreneurs to develop their business ideas instead of attending college. Like other bubbles, college is “characterized by runaway costs where people are paying more and more for something whose quality hasn’t gone up,” Thiel argued during an October 12 debate in Chicago sponsored by the New York-based debate series Intelligence Squared U.S.
College advocates counter that higher education has never been more vital as employers demand the advanced schooling and training that are required of workers in a global, technologically oriented economy. “China and India are educating,” says Vivek Wadhwa, who holds research positions at Duke University, Harvard Law School and the University of California at Berkeley. “If we’re going to dumb down America at the same time the world is getting smarter, we’ll become a Third World country,” notes Wadhwa, founder of two software companies. The price of schooling has indeed been rising at a breakneck pace. Tuition and fees at U.S. colleges and universities climbed 439% in current (unadjusted for inflation) dollars from 1982 to 2007, according to a 2008 report from the National Center for Public Policy and Higher Education in San Jose, Calif. That topped the 251% rise in U.S. health care costs over the same stretch, and was nearly three times higher than the growth of median family income. While the $50,000-plus sticker price of elite private colleges and universities has gained headlines, the increases have hit public schools that enroll some three-quarters of all U.S. undergraduates particularly hard. Cash-strapped states are driving the increases by slashing funding, leaving students to foot more of the bill. Tuition and fees have more than doubled at the University of California since 2005, for example, igniting student protests at the Berkeley campus this fall. Along with soaring costs have come growing debt loads. On average, U.S. college seniors who graduated in 2009 carried $24,000 in student loan debt, up 6% from the previous year, according to the Institute for College Access & Success in Oakland, Calif. President Obama has announced plans to use his executive authority to institute an initiative to lower student loan payments for many borrowers, offer additional consolidation options and shrink the time period after which any remaining debt would be forgiven. Debt-burdened graduates face the toughest job market in years. Data collected by the Center for Labor Market Studies at Northeastern University show a drop in the share of graduates under the age of 25 who have jobs from 81% in 2000 to 74.4% in the period from October 2010 to March 2011. The share of recent graduates with jobs that require a college degree fell farther, from 59.7% in 2000 to 45.9%, indicating that some graduates have resorted to positions like waiting on tables or parking cars. Meanwhile, automation and the transfer of U.S. jobs to other countries are reshaping workplace demand. Microsoft Excel software now performs tasks that once required in-house computer programmers, notes Wharton management professor Peter Cappelli, and computer technology has made it easier to move white-collar jobs offshore. Radiologists in Bangalore, India, routinely read U.S. hospital x-rays, he adds, while workers in the Philippines handle U.S. back-office banking chores. These trends will only accelerate. “The range of easily off-shored jobs will get bigger and bigger over time,” says Princeton University economist Alan Blinder. The college graduates most likely to suffer are those “who get pushed into going to college because ‘you have to,'” and land in jobs like computer programming that are easily moved off shore, notes Blinder. These individuals will be forced to compete with low-wage earners in other countries “and not get much return” on their college investments. The good news for college students is that incomes tend to rise along with education. “The empirical evidence on this is very clear,” says Anthony Carnevale, director of the Georgetown University Center on Education and the Workforce. “A bachelor’s degree is now worth about $1.2 million more than a high school diploma” in average lifetime earnings, he notes, while virtually any post-secondary education can boost income. A two-year associate of arts degree is worth about $425,000 more than a high-school diploma, for example, and college dropouts can still earn more than $240,000 more than students who stop at high school. Plenty of variation exists within these estimates, of course. Petroleum engineers with a bachelor’s degree have median earnings of $120,000 a year, or more than three times the $36,000 median income for graduates who teach preschoolers after majoring in early childhood education. “What you [major in] matters a lot,” says Carnevale. 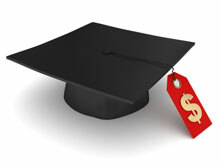 Some college graduates may earn less than workers with a high school diploma. An electrician who never went to college can earn $1.8 million over a lifetime on average, according to Georgetown figures, compared with $1.5 million for a real estate broker with a bachelor’s degree. Thiel noted in Chicago that he hired only graduates of top colleges for PayPal jobs at first. But he gradually changed his mind. “In Silicon Valley I saw so many talented people who had not gone through college tracks and had done extraordinarily well. In some ways, they were more creative [and] were not weighed down with these enormous college debts.” That apparently helped inspire his Thiel Fellowship awards to enable budding entrepreneurs to develop their business ideas instead of going to school. Wadhwa says a study of some 500 engineering and technology firms that he coauthored illustrates such points. It found that startups launched by college graduates from 1995 to 2005 outperformed those started during the same period by entrepreneurs with only high school diplomas. Companies launched by the high school graduates averaged less than half the annual sales and number of employees as compared with the average for the startups as a whole. If education is vital to success in the global economy, other countries appear to be gaining on Uncle Sam. The United State ranks seventh out of 29 advanced countries in the percentage of young adults enrolled in college, and 15th in terms of the number of certificates and degrees awarded per 100 enrollees, according to the National Center for Public Policy and Education. Many high school graduates are turning to community colleges for vocational training and the chance to transfer to four-year institutions. Enrollment in two-year schools rose from 45% of all students in U.S. public colleges and universities in 1990 to nearly 49% in 2009, data from the National Center for Education Statistics (NCES) show. For-profits have also drawn fire from critics who charge that many schools have low graduation and job placement rates, together with crushing levels of student debt. The Obama administration in June issued rules requiring for-profits whose students get federal loans to show that graduates can meet certain repayment requirements.